Ukraine for long had a specific posture, rather independent towards Russia, although forcibly integrated since the XVIIth century, notably to allow an access to the black sea. Crimea has been a highly strategic asset since. Ukraine has also the richest ancient archaeological remains from the mysterious Scythians through burial tombs (of which many treasures are now exposed at the Hermitage, St Petersburg). The large, barren steppes always seemed tailor-made for nomadic horsemen, and eventually will give Ukraine its own flag (the blue of the sky and yellow of the steppe). The Sarmatians later subjugated the Scythians and ruled this area for centuries (they also became part of the late Roman Army and perhaps the inspiration for the first chivalry). Kiev became a powerful and independent Kingdom funded on trade, the Kievan Rus formed their own chivalry with the Druzhina in medieval times. Ukraine has been also the haven for the Cossacks, misfits and exiled which formed the Zaporozhian Host and further cultivated this tradition of autonomy and independence while being famous as a buffer to the Islamic world and especially the Tatars in the XVII and XVIIIth century. Before the communists took over in 1917, Ukraine saw the origin of the revolution in the 1905 black sea insurrection (events around the Potemkin affair). During the civil war, several armies fought each other: The Army of the Ukrainian People’s Republic, the anarchist Revolutionary Insurrectionary Army of Ukraine (or “black Russians”), Ukrainian Galician Army (white Russians) assisted with Sich Riflemen. Under USSR rule, this country remains the granary of Russia and provided the bulk of its oil reserves (around Baku) whereas Stalingrad became a major industrial hub. After Operation Barbarossa was launched in 1941, later frozen before Moscow and restarted in spring 1942, Ukraine rapidly fell to the rapid pace of blitzkrieg, reaching the Don. SS exactions eventually nullified the sympathies Ukrainians initially had for what were called “liberators” from the Soviet rule. An ex-Ukrainian general, Vlasov was even at the head of a pro-German “Ukrainian Liberation Army” made of former prisoners (mostly Ukrainians), whereas some Cossack hosts became auxiliaries of the Wehrmacht. However, Stalingrad became the center of the war on the Eastern Front and saw a complete reversal of fortune for the Axis. From there, Germany and its allies were thrown into retreat, and the Ukrainians actively participated in all red army offensives, from the Don to the Rhine. The famous Morozov design bureau, from the Kharkiv locomotive factory, have been both central, instrumental in the conception and production of the T-34, in Ukraine. Early on with the T-12 and T-24 light tanks, the BT series, and the T-44. This expertise was carried out with the “two tanks policy” wanted by Moskow after the war, which traduced by the T-54. The development of the series was later passed on to the Kartsev Design Bureau at Uralvagonzavod, while Morozov started the revolutionary T-64 and eventually led to the T-80UD in the 1980s by what is known today as KMDB (M in honor of Morozov), which still pursue the development of new upgrades to this day. Outside these remarkable achievements, KMDB and the Malyshev factory delivered tens of thousands of Soviet vehicles of all types. All this industrial expertise was passed onto the newly independent state of Ukraine in 1991. At that time, the heritage from the Soviet era traduced as 780,000 personnel, 7,000 armored vehicles, 6,500 tanks, and 2,500 tactical nuclear missiles. Most were later dismantled, scrapped, or stored for future modernization. Today the nuclear park is drastically reduced, under the Missile Technology Control Regime (MTCR) program. International cooperation, (noteworthy the USA) ensured no known stockpiles left from the departure of Soviet forces ever joined the black market, avoiding the proliferation of relatively discreet nuclear heads. As of today, the total army personal (reserve, navy and air force included) is 280,000 strong, with 700,000 as a reserve. Conscription comprises 12 months of compulsory service whereas, in case of war, 11,149,646, age 16–49 are considered fit for service. The ground forces themselves were found at the head of the ex-soviet 1st Guards Army, 13th Army, 38th Army, 6th Guards and 8th Army (both tank armies), and the 32nd Army Corps, plus the 28th and 180th Guards Motor Rifle Division. Until 1992 they were commanded by the provisional Kiev Military District, later disbanded when the Ministry of Defence was properly organized. Colonel General Vasily Sobkov was the first ground army head of staff, named in 1994. Status of the ground forces was fixed by the Article 4 of the constitution. The 1st army corps became the Northern Territorial Operational Command, then Northern Operational Command in 1998 whereas the Carpathian Military District became the Southern Operational Command. The siege moves from Kiev to Odessa, and then to Donetsk. While the 2nd army corps was established, attack helicopter regiments were added organically to the new mechanized divisions/brigades (former motor rifle divisions). These were of first importance. In order to improve the general quality of the army, it was to be reduced to 250,000 by 2015, and the conscription abolished, for a fully professional army only. Lots of units and bases were dismantled. With the funds reallocated, modern equipment could be purchased and the frame for a better training established. In particula, in 2006, the Joint Rapid Reaction Forces (JRRF) was setup for participate in multinational exercises, both as a host in Ukraine or guest. Currently there are four training ranges and three military schools. T-64BM Bulat. 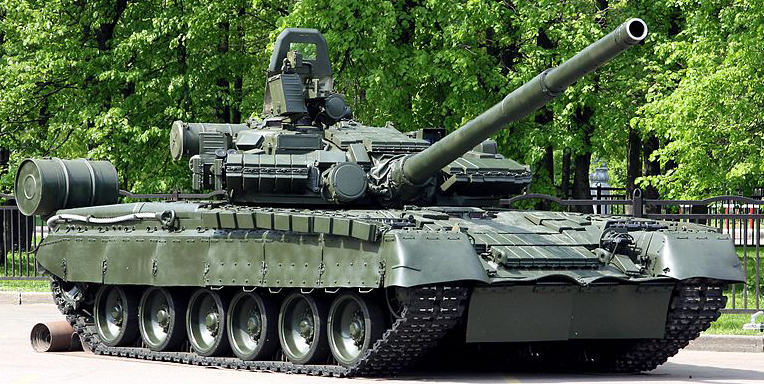 Around 120 of these well-modernized T-64 are given to elite batallions along with a few T-84BM Oplot. In addition, the Ukrainian Army, like its soviet predecessor have an important airborne arm, now represented by the 25th, 79th, 80th, 81st and 95th Airmobile Brigades. In addition there are 60,000 internal security forces, the National Guard dependent of the Ministry of Internal Affairs, the volunteer Territorial defense battalion formed in 2014 to counter Russian insurgency, the border guards (50,000), Civil Defence Forces (10,000) and Special Transportation Service. 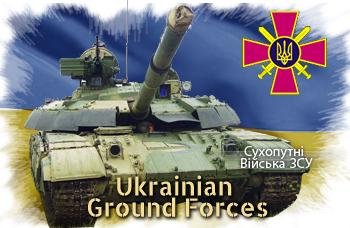 Actual composition of the Ukrainian ground forces includes the 1st, 17th and 30th Armored Brigades. At a larger scale, they are part of the 6th, 8th and 13th Army Corps. They are equipped with T-64 and T-64BM “Bulat” MBTs; BMP-1/2/3 IFVs, and BTR-60/70/80, wheeled APCs. The artillery branch is equipped with MRLs (Multiple rocket launcher) as the Smerch, Uragan and Grad and the soviet-era Giatsint, Pion, Akatsiya, and Gvozdika self-propelled howitzers. Ukrainian troops and AFVs participated in the Kosovo Force (KFOR), were present in the Iraq War, in Afghanistan (2001 to present day). 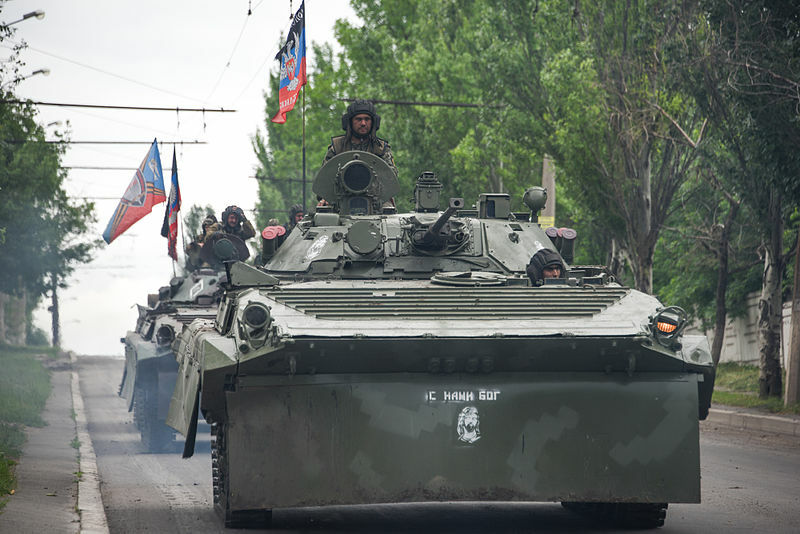 DPR (Donetsk People’s Republic) BMP-2 infantry fighting vehicles in convoy, Donetsk area, may, 30, 2015. Wikipedia alleged of several hundred T-64BV and several dozen T-64BM were destroyed or captured, which seems enormous (no sources to back this up). In reality no great tank battle took place so far, with the exception of the Donetsk airport where perhaps 50+ tanks were engaged in total. But that does not rival Kursk or the Golan heights… Now as these lines are types the front line is settled between the Ukrainian government and the insurgent’s Donetsk and Luhansk People’s Republics. The battle of Yampil (june, 19) was another significant engagement. Another battle took place at Shakhtarsk Raion in july. However in august, well-equipped, tanks-supported pro-russian insurgents made a large counter-offensive leading to the Battle of Ilovaisk and Battle of Novoazovsk. However the Ukrainian national guard tackled the advance and retook (temporarily) Komsomolske (Starobesheve Raion, Donetsk Oblast). A ceasefire was signed in september, but not respected everywhere. Multiple clashes erupted, followed by new ceasefire in february 2015 back by France, Germany and the USA (Minsk II agreement). T-84BM/U Oplot (1994)An Ukrainian development of the T-80. So far, 40 in service, 120 in order for 2015. T-80BV167 were in service but put in storage in 2015 for a complete overhaul. At least 8 were completely overhauled. 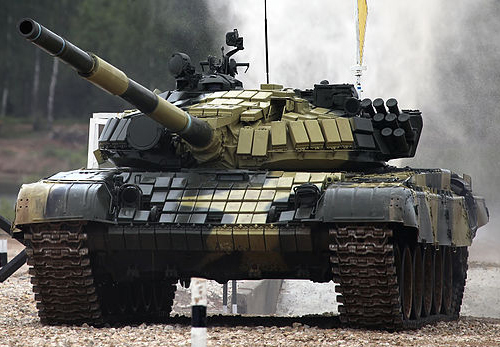 T-64BM BulatAround 1,000 BM are in storage, pending gradual modernization. Only around 120 BM Bulat and 550 BV are maintained in service. T-72BM700 of the entire park available were sold to third world countries, 300 T-72B1 are in storage waiting for a modernization (negotiations with Poland) while around 8-12 are in service as locally modernized T-72UA1. 600 T-72M1 are also in storage. 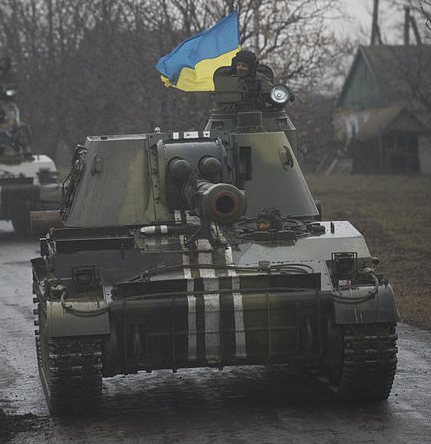 BMP-2 BMP-2s provide the mainstay of the Ukrainian IFV force, with 1,400 in service prior to the Donbass war. (1,200 today). They are completed by 4 BMP-3 and around 994 BMP-1s, 485 BMP-1K, and some 30-40 modernized BMP-1U. In addition the airborne uses 78 BMD-2, 61 BMD-1 and 44 BTR-D APCs. BTR-4 (2005) Around 160 BMP-4s are in service. Here a BSEM-4 armoured ambulance profile (around 12 in service). 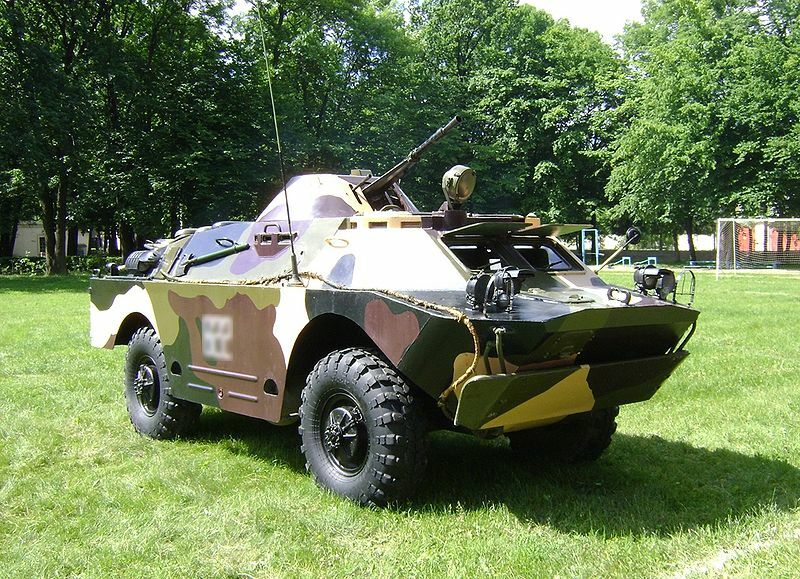 The “Bucephalus” is a specifically Ukrainian 8×8 APC developed by KMDB as a private venture and revealed in 2006. They are mostly used by the airborne. Tracked APC comprises around 15 PTS-2, 2,300 MT-LBs (most being upgraded and overhauled), and 120 BTR-50s. BTR-80 Around 330 BTR-80 are in service today (photo), along with 200 (over 700 -most in storage) BTR-70s, and originally 2,000+ (mostly scrapped). The modernized version BTR-7 is still in project. 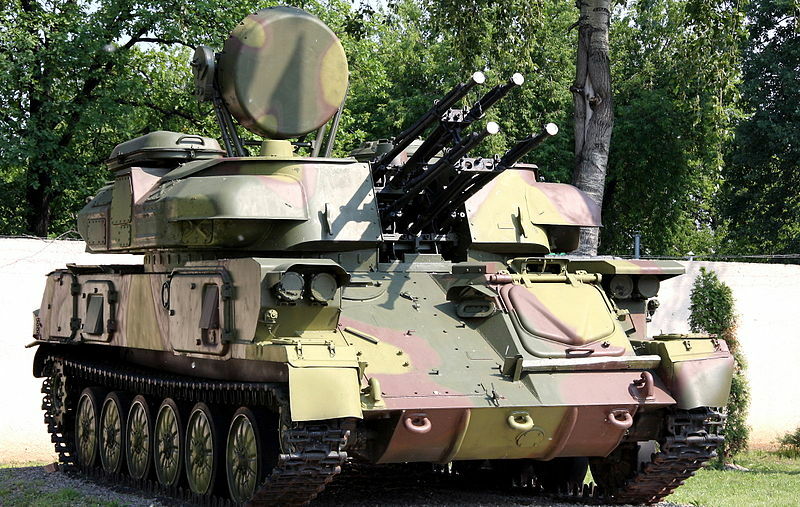 Less than 20 BTR-60PBs and one specialized P-145BM/PU-12 are also registered. BRDM-2 Around 600 are stored, pending modernization as the BRDM-2D “Khazar”. Still, 20 BRDM-Konkurs are active as tank destroyers. The fleet of BRDM-1 was scrapped, stored or used in small numbers (wfter overhaul) by Various Territorial defense battalions in the context of the 2014 war. KrAZ Spartan Around 34 of these vehicles developed with Canada (2014) are used by the airborne (as 2 Kraz Shrek). 90 Italian-built Iveco LMV are on order or partly delivered. In march 2015, the US supplied also 30 M1151 Humvees. 2S3 “Akatsiya” The Ukrainian SPG feet comprises 580 modern 2S3, 630 2S1 “Gvozdika” (most are in storage pending overhaul), 40 2S19 “Msta-S”, 99 2S7 “Pion”, 24 2S5 “Giatsint-S”, 64 2S9 “Nona” (most in storage). MRLs are also mostly in storage with the exception of the 99 9A52-2 “Smerch”. These stockes comprises also 50 9K52 Luna-M, 90 OTR-21 Tochka. Three Ukrainian tactical ballistic missile erectors are in development: the Sapsan, Korshun-2 and Grom-2. ZSU-23-4 Shilka These are modernized versions of the classic ZSU-23-4 developed in the 1970s, which had been coined as one of the best SPAAGs ever designed. However on 300 enlisted, most are in storage, pending overhaul, perhaps 20 are combat-ready. In addition, there are 70 Tunguska M1. SPAAMLs are the 9K35 Strela-10 (150), 9K33 Osa (125), and some long-range vehicle were reactivated from storage due to the war in the Donbass,36 S-200B, 80+ S-300PS, and 8 S-300V1.